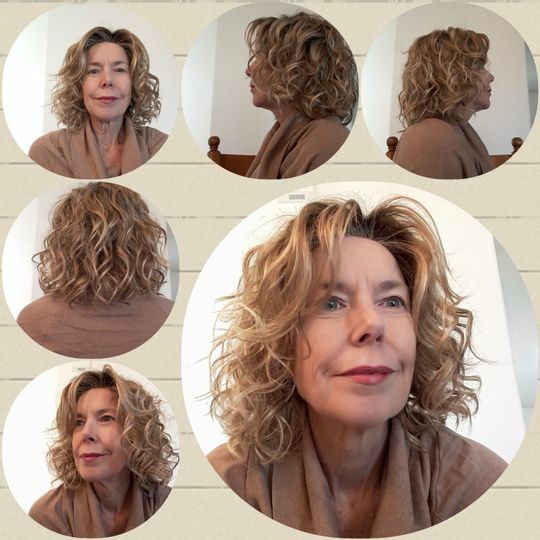 Girl Mono by Ellen Wille is a trendy, mid-length style with perfectly placed curly layers. Note about Ellen Wille wigs: Ellen Wille wigs are imported from Germany. Because of this, it may take up to a week of additional processing and up to 14 days shipping for your item to arrive. Please plan accordingly! - Bang: 6.5", Crown: 7.5", Sides: 9", Nape: 5"
Girl Mono by Ellen Wille is an on-trend, cute and curly do with tons of layering. She features a 100% hand tied monofilament part, an impeccable temple-to-temple lace front and open wefting on the sides and back. The density of the ready-to-wear synthetic hair mimics the look and feel of biological hair and requires little to no customization or thinning. Girl Mono is part of the Ellen Wille Hair Power collection. My 1st Ellen Wille! Took advantage of Heather's sale to try Girl Mono. Now THIS is a realistic wig. The density is omg so real. No thinning needed. I got sandy blonde rooted and the color is perfect BUT the root is almost black. I will go over that with brown root spray. I don't quite understand why its black, but its an easy fix. You can't even feel this wig on your head or even feel the lace front. Lace fronts often hurt my skin but this one is impeccable and pain free. Wow, just wow!! Why can't all wigs feel this NORMAL?? I did not know what i was missing, I just knew there had to be a wig that felt like my own hair. Melissa K. Reviewed by Melissa K.
Although the color is a little light for me (might look better with a tan later this year) I love Girl Mono. In fact, I've ordered it in chocolate rooted which will hopefully be a better color for me. But the wig is fun to wear. She can be full and sassy or tamed down with a spritz of water. I have worn her with hair clips and headbands, as well as "wild and free." She is also one of the more comfortable wigs I've worn and the lace front is perfect. The ordering process was very easy also. Ellen Wille sizing is on the petite end of the spectrum and a great fit for my 20.5" circumference head. Good ear tab coverage but larger heads my not be so well suited. Light Bernstein rooted is a nice amber blonde shade which would go well with many skin tones. The shorter length reduces friction and wear on the fibers to increase the amount of useful wearings. The fibers look and feel real to touch. The lacefront and mono features add to the realism of the unit. Lots of compliments when wearing this comfortable wig which doesn't get "monotonous" at all. Debera C. Reviewed by Debera C.
I have been wearing this for about three weeks in Caramel Rooted. Maybe because I've been a brunette all my life I find this very, very blonde! But that's ok, it works!!! The curls start higher on the head because of layers. Love it! The fibers are silky soft. Love it! I have not experienced any severe tangling or friction wear. Love it! Even though I'm an average, sometimes a little large, cap fits great. Love it! The lace front is crazy realistic. Love it! Sooo many compliments. People truly cannot tell it's a wig. To those I disclose the truth, they can't believe it. One lady even went as far as to have me write down this website, the name of the wig and color! It gets a tiny bit fuzzy looking, but not bad at all. It makes it look even more realistic instead of being Barbie doll hair smooth. Everyone loves it except for my husband, but that's because he's not into curls. Thank you very much indeed for the word-of-mouth recommendation! Much appreciated!